After Stockholm, I had a great visit to Copenhagen. Our wines have been imported into Denmark for two years now and it was a pleasure to meet our importer, Ole Jensen, in person. On Wednesday, he suggested we go to Sweden for lunch after I arrived at the airport. I was, of course, confused. (Fly from Sweden to Denmark to go back to Sweden?) After picking me up, we drove across the Oresund bridge to Malmo. We at lunch at a little restaurant called Bloom in the Park. It was by far the best meal I ate in Sweden and reminded how much I love Europe. Open for lunch by reservations only, we were served by the owner and the chef. The highlight was Swedish Truffles. I didn't know they existed - they do and they are great. Ours would found by Robin Hund - if you read Swedish, which I don't, you can read more about Robin Hund on Bloom in the Park's Blog. After the lovely lunch and an hour exploring Malmo, we returned to Copenhagen. Wednesday evening, Donkey and Goat was featured at a great wine maker dinner. The dinner for 24 was held at a private residence full of wonderful, contemporary Danish art. The dinner was great and went on late into the night. (I think I left around 3AM.) The guests were passionate about wine and had extensive knowledge of American wines. And our host, Ole, made me feel at home by even including cranberries on the menu in a nod to Thanksgiving. 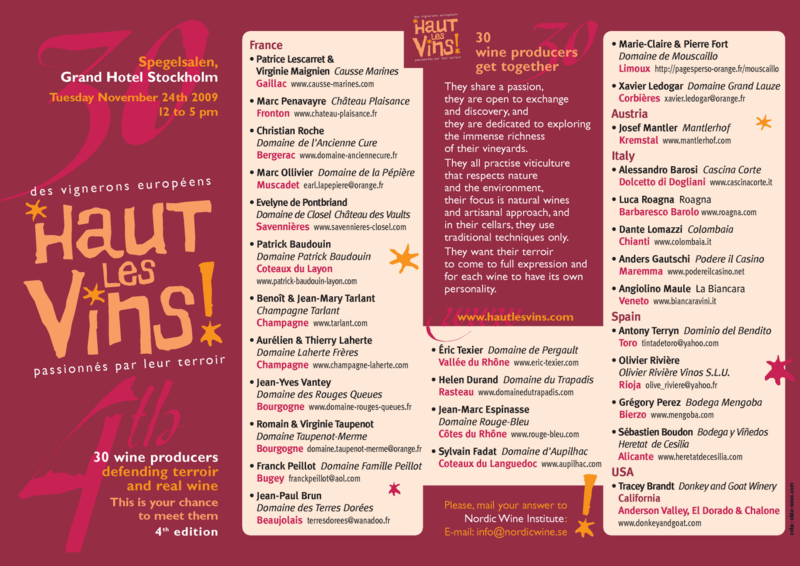 Last Tuesday, I had the pleasure of pouring at the Haut Les Vins Tasting at the Grand Hotel in Stockholm, Sweden. As the event started, I marveled at the room. Trade wine events are often held in large hotels - but this one had a bit more history than I am used to . The event was extremely well organized - names tags with color codes to understand who you were talking with for example (Importer, Retail or Restaurant ). And it went well for us. Many people in the trade enjoyed the wines - several restaurants will take the wine as soon as it makes it to Sweden. And, most importantly, I hope to announce a Swedish and Finnish importers soon. I am just learning about taking photos with my new phone - a Droid. So these didn't turn out great but I think you will get the idea. 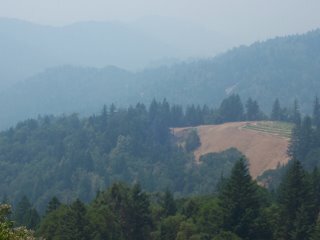 Two of our Syrah Vineyards are off the grid in Mendocino. We spent time at both of them this past weekend. Perli Vineyards is south of Anderson Valley beyond the end of the pavement on Fish Rock Road. It has been in the Alden Family for several generations. The vineyard has a complete collections of wildlife - rattlesnakes, bears, scorpions, goats, deer, and raccoons just to name a few. In fact legend has it that Steve Alden, the owner, made a living trapping animals many years back. We grafted a vineyard over a few years back with Steve - Hog Pen. In this video, Steve talks about the clones and the vineyard name. We like 877. He likes 174. As a family, we camped on the vineyard. Didn't see a bear or a live rattlesnake, but we did see a scorpion. Isabel makes a short appearance in the background. We left the Prius at the cabin/campsite this time - didn't want to have it towed out from the vineyard again. The Fenaughty Syrah (15 Brix) just looks and smells too good at this point to wait for the finished product before tasting. So, we won't. The nose itself is very potent and earthy, and almost knocks you on your feet. The sweetness of the grape softens the otherwise grassy or tree bark aroma. The initial taste is also earthy, but quickly smooths out, leaving a lingering flavor of tart, sweet cherry. At this point, the wine would nicely complement a hearty rack of lamb, or even a blueberry pie! Last week, we also visited our Perli Vineyard. We have called our two sections by various names over the last two years - Hog Pen, Hog Pen Upper, Potato Patch and sometimes Steve Alden's place. Hog Pen (the lower vineyard) pictured here and below was grafted over last year from Merlot to Syrah for us. We think this will be a great vineyard. The grafts generally took well and, as you can see, we have great growth. I don't remember when the vineyard was first planted. I think it was 1996 or 1997. The rootstock looks solid and is helped by Steve's limited access to water (and thus watering) I think this may be a near perfect spot. Steve is clearly a great vineyard manager. He is currently experimenting with modifying his trellis system on the Potato Patch Syrah. The goal is to increase yields while improving overall ripeness with a focus on balance and finesse. It is an interesting experiment. Many people are obsessive about low yields which sometimes lead to out of balance grapes and wine. I think his idea (somewhat similar to a Lyre system with cane pruning if I remember correctly) will work well. 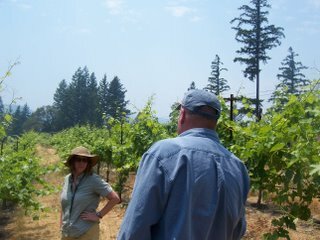 Syrah grows vigorously and this approach will limit the amount of pruning that will need to occur to manage the canopy . It should also increase the amount of foliage getting light and increase air flow within the vines helping with mildew. It will be interesting to see how his experiment turns out. We have two barrels of the 06 Perli that will be held back for our new reserve program. Expected release date - August 15th 09. Tim Patterson's article in Wine and Vines on wild yeast features us and it a worthwhile read. Using wild yeast is "not safe winemaking," says Greg La Follette, who does it at Tandem Winery. Chris Loxton, former winemaker at Wellington now producing his own Loxton Cellars wines in Sonoma County, does most of his Zinfandel and half of his Syrah with ambient yeast, aiming for complexity and mouthfeel, even if it means giving up a little fruitiness. Greg La Follette at Tandem Winery, a Sonoma Pinot and Chardonnay specialist, sees complexity and mouthfeel as the result not only of multiple natural yeast strains, but of having all of them scuffle to get their work done. Jared and Tracey Brandt at A Donkey and a Goat, one of the San Francisco East Bay's many start-up warehouse wineries, got their training under an old-school winemaker in France, and try not to add anything to their reds or whites--yeast, nutrient, you name it--in hopes of getting more out of them. It is the time of year when we get Parker's reviews of our wines. As always, we are thrilled that he reviewed them and liked them. Highlights include be called "innovative" (perhaps he likes the ver jus or the puncheon fermentors) and having our 05 Fenaughty called "silky-textured" while he moved the score up from 88 to 90. Our Chardonnay is again called "Chablis-styled". Parker also increased our old vines score from 87 to 89. I hope he has the chance to re-taste all of these in another year or two - I would expect the scores to go up again. It is the time of year where we want to get a better handle of the new wines. We do this two ways - the fun one is tasting each barrel. One or two nights a week, we taste through barrels. Usually somewhere between 7 and 14. (No special reason on the number except that our maloactic testing is limited to 14 barrels a night.) Last night we tasted through the Fenaughty Vineyard Syrah. This was the first wine we made in our 4 ton open top oak fermentor. The wine was showing well - across all 7 barrels. (We didn't get 4 tons of grapes.) Our notes include: pepper, basil, BBQ/smoked meats, graphite, fresh off the tree cherries, medium to look finish and good balance. The wine tasted like it was just finishing up malos - will know more today. Thursday morning was spent in the foothills. It was a cool, crisp morning with my car reading 48 degrees when I stepped outside for the first vineyard check. You can feel fall it the air - it is wonderful. The recent cooler weather is allowing everything to slow down. We will harvest the rest of Lightner Syrah and the Lightner Grenache next week and possibly our Grenache Gris. Everything else needs time. Wylie Syrah is going to barrels on Monday! Whoa! We also picked some of our Lightner Syrah this morning. The yield was below what I was expecting. We are trying two picks on Lightner this year to better understand when it is exactly right to pick this vineyard. Last year we were only able to pick a barrel's worth. This year, we are getting more and are very excited! Steve Lightner has a great blog - On the Contrary. It is worth a read. The fruit is in the fridge wait for an early morning sort before cold soaking. Flavors are great, sugar is perfect as are acid. On Friday, we spent an hour in the Broken Leg vineyard. It is an incredible place - as steep as CÃ´te RÃ´tie with a similar climate. CÃ´te RÃ´tie means roasted slope - it is about as far north as Syrah will ripen in France. (There is or will be some Syrah further north in the Beaujolais but that is another story.) Broken Leg is also a roasted slope. Very cool area but a pocket of warmth. The vines look good. They have just barely begun to flower. We expect it to complete in the next few weeks. We are beginning to understand the vineyard - seems like it takes us about 3 years to really get it. This will be our third year and we are very excited. We spent the day in Anderson Valley seeing Broken Leg and Hog Pen vineyards. Hog Pen will become a great vineyard. Last year and hopefully this year, we will get upper Hog Pen. It is planted with a variety of Syrah clones. Much more exciting, we went and saw lower Hog Pen. This vineyard, planted with Merlot in 1995, is being grafted over with Syrah - 877 and 174 and will be ours for the next five years at least. 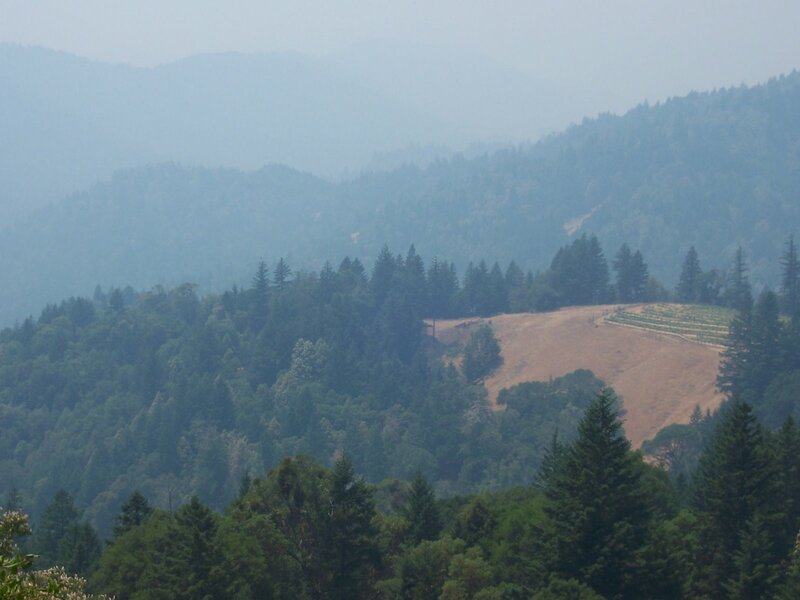 It is located in Mendocino Ridge Appellation tucked near the top of a ridge. Lower Hog Pen won't produce fruit until next year. Upper hasn't flowered yet. The only downside, it is beyond the Prius' reach. We were supposed to meet the grower at the end of the paved road. Due to the lack of cell phone coverage, we missed him. Wanting to see the vineyard, we ventured down the steep road with our little Prius. The Prius is great for vineyard visits - we often get 60 MPG on the road. We made it to the vineyard. It look great and we are very excited! Only problem, the Prius didn't have the traction to make it our of the vineyard. We got about halfway up the hill and no go - we started to spin. We had to be towed - oh well, all in a days work.